4Easysoft Mac FLAC Converter is an excellent FLAC Converter for Mac software with easy-to-use interface and perfect output quality. It can support FLAC (Free Lossless Audio Codec) as the input formats and convert them to diverse audio formats AAC, AC3, AIFF, AMR, AU, FLAC, MP3, M4V, MP2, OGG, WAV, WMA. And it can also extract audio tracks from FLV, SWF and play them on your MP3 players. With the concise interface and design, 4Easysoft Mac FLAC Converter is much easier and faster to use. In addition, it has many additional features such as Trim, Join, watermark, Setting parameters to meet your editing fulfillment. Acting as FLAC to MP3 Mac conversion tool, it can convert FLV and SWF to FLAC on Mac and also convert FLAC files to AAC, AC3, AIFF, AMR, AU, FLAC, MP3, M4V, MP2, OGG, WAV, WMA audio for Mac users. Drag scissors button below the Preview Window to mark the beginning and ending points of your clip to get your favorite segment and remove unwanted parts. 4Easysoft Mac FLAC Converter provides an easy way to combine and join multiple files together to listen without interruption. With this watermark function, you can add picture or image onto the presentation to increase unexpected effects. 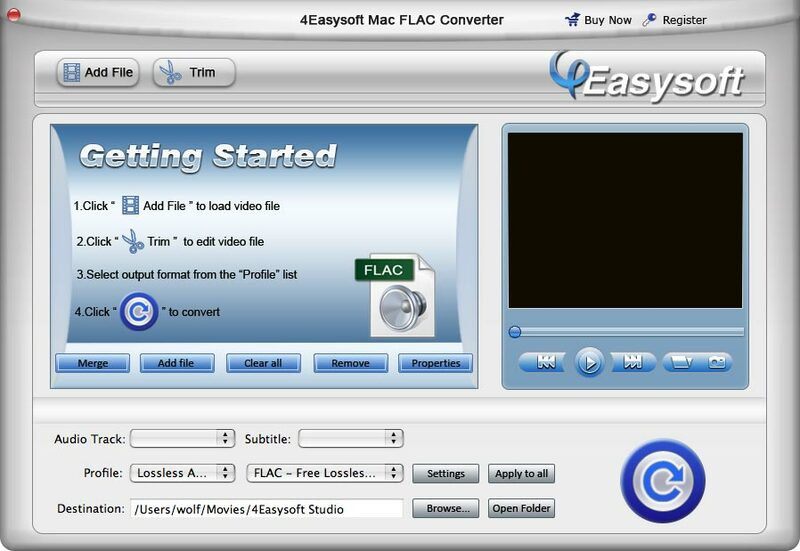 4Easysoft Mac FLAC Converter gives access to revise audio track and subtitle of the movie. Detailed adjustable audio settings are provided such as Encoder, Audio Channels, Sample Rate and Audio Bitrate. You are allowed to save all the output settings as your preference, which is saved in the user-defined column automatically for future use. You can preview the original and edited effect at the same time to check whether it is just you want. When the highlight image comes to the screen, take snapshot to capture it and save it as the form of JPG, GIF or BMP. Having the user-friendly and smartly organized interface, 4Easysoft Mac FLAC Converter makes your conversion job just a button click away while maintaining the excellent audio quality in lossless. Add watermark to adjust its horizontal, vertical position, even its transparent. Different formats come from converting one time.